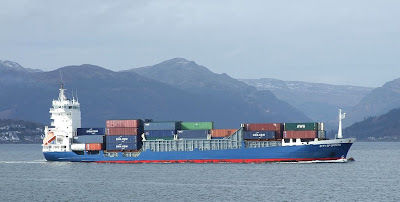 Seen arriving inbound today from Liverpool, the container ship CITY OF OPORTO paid a short visit to Greenock before setting off again this evening for Rotterdam. Partnering WERDER BREMEN on the MacAndrews service from Northwest Europe to Portugal, CITY OF OPORTO is owned by K&K Schiffahrts GmbH & Co although she flies the British flag, with London as her port of registry. She was built at the Sietas yard in 1998, and is one of their typical hatchless Type 160 ships, with hydraulic covers on the forward holds only. She can carry up to 700 TEU, 100 of which can be refrigerated plug-in 'reefer' boxes.